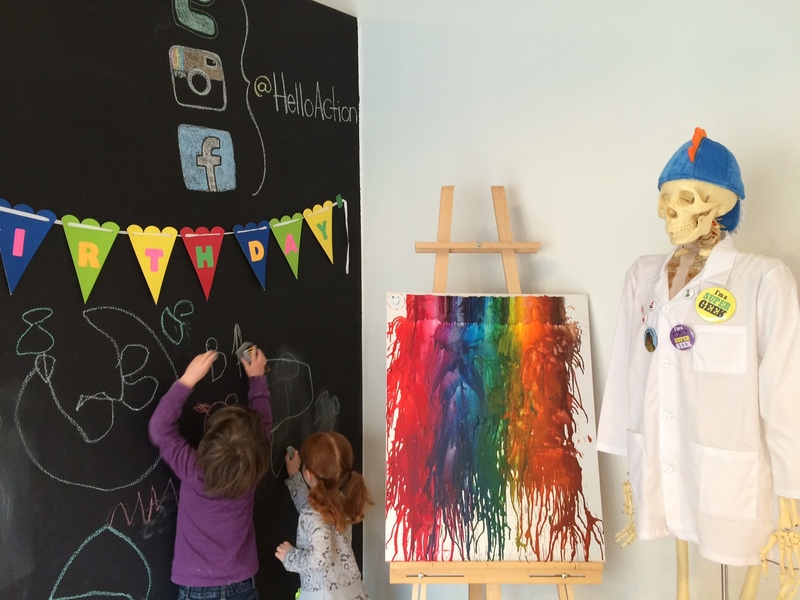 Action Potential Lab | Kids in T.O. Science + Art. This may be the best combo to describe our family. So when Action Potential Lab – Toronto’s first lab dedicated to merging science concepts with crafty creativeness – we couldn’t wait to stop by. The lab is spacious (we were ten-ish kids and accompanying adults) and clean. The walls and shelves are covered in all sorts of curiosities, inspiring non-stop questions from the kids. And the instructors were more than happy to engage. If you haven’t had a chance to check out their offerings, you can get a taste during their first-ever drop-in event on Family Day, Monday, February 16, 2015. The Food Science Spectacular from 10 am and 3 pm will have you performing amazing experiments and activities like – DIY gushers, fruit-and-veggie-powered batteries and glow-in-the-dark Jell-O. Getting there: Driving, there is paid street parking in the area ($1.50/hr.) On TTC, from Spadina Subway station take the 127 Davenport to Christie St. or from Christie Subway station on the Bloor line, take the 126 Christie to Davenport Rd. Low-down: Action Potential Lab offers after school classes, PA day and week camps, youth workshops and birthday parties for all ages. They also have Adults in TOw covered. All the details are online. Shop: We also love their Lab Store. It has tons of gift ideas from lab coats to chemistry kits. Mark your calendars: The Food Science Spectacular on Family Day, Monday, February 16, 2015 is from 10 am and 3 pm. $5 to cover materials. Please bring a non-perishable donation for the neighbourhood food bank The Stop.